Lily Kato, nine years old, keeps a journal of her last year at Minidoka, an internment camp in Idaho for Japanese Americans during World War II. Throughout the year, Lily questions why she and her family must live behind barbed wire. They have done nothing wrong. Why do people see them as the enemy? As the war draws to an end, Lily knows she has a story to tell. 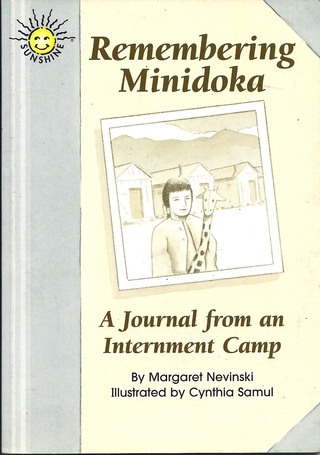 Remembering Minidoka: A Journal from an Internment Camp (Wright Group/McGraw-Hill), is a moving story of one girl’s experience during a shameful chapter of World War II. The book, now in its seventh printing, is used in classrooms (Grades 3-6) across the country. I had just begun my story when a teacher rushed into our room. She told Miss Mori that the wind was starting. We all knew what that meant. A dust storm! I was so busy writing that I didn’t notice the dust coming through the cracks in the wall. Miss Mori and the other teacher talked about what to do. Finally they decided to send us home to our barracks. They were afraid the wind would get worse. Yuki and I held hands and set out for Block 15. The wind hit us as soon as we stepped out the door. Swirling dust was everywhere. We kept our eyes on the dirt road. Soon dust covered us from head to toe. I could feel dirt in my teeth and hair and eyes. I live on Bainbridge Island, Washington, site of the first forced removal of American citizens to unconstitutional internment camps in 1942. I was inspired to tell the story of one girl living through that experience. As part of my research, I talked to women and men who had been incarcerated at Minidoka as children. I’m grateful to them for sharing their stories.